"THE PLEASURES HERE ARE WELL KNOWN"
Beginning with the unconsciousness of a doodle, but executed with the commitment of surgery, Susan Stacks creates drawings with pencil and pen that are artifacts of a meditative experience. These intricate and elegant works reference landscapes, microscopic forms, and cartography. As Ms. Stacks draws, a twist becomes a tug, a dash a dot. Her influences are as varied as novels, mythological figures, plant and bacterial life, rock stars and vending machines. She refers to her drawings as emotional maps, parasites, friends, and penance. This exciting lecture and exhibition is opening at George Mason's School of Art Fine Art Gallery. Washington Realism gathers representational paintings by local and regional artists who paint “what the eye can see." Each artist in the exhibition approaches a challenge that has persisted in painting for more than 3,000 years—that of realistically representing people and places—what we might call our perpetual reach for realism. Realism as a modern artistic movement developed in opposition to the romanticism dominating 19th century French painting. It coincided with the advent of photography, which solidified a concept of the everyday as subject matter. As similar as we believe our ideas of reality might be, each painting in the show attests to how varied reality is from one artist to another, as well as from one observer to another. Yet, the show possesses a collective viewpoint. Contrary to the political drama and imagery projected by mass media to those outside our nation’s capital, these artists choose to eschew the glitz and glam and depict the everyday. Crystal Couture – The DC area’s hottest fashion SHOW and high-end bargain trunk SALE returns to Crystal City this February 7th to February 11th, 2012. Crystal Couture – Show & Sale brings over 40 of the metropolitan area’s most stylish boutiques and designers all under one roof. The one-stop shopping experience lets guests browse discounted offerings on the rack AND on the runway as models showcase offerings of participating boutiques. Music from DJ Neekola. Experience the one-of-a-kind ambiance that is Crystal Couture! George Lucas' version of the story of the Tuskegee Airmen, 20 years in the making. First days of release is in theaters January 20th. SEE THE MOVIE WHEN IT PLAYS IN A THEATRE NEAR YOU! Lantz’ paintings from "Into the Wild" reflect personal life experiences painted with bold colors and collaged abstractions. Lantz’s show is inspired by her recent safari to South Africa, Botswana, and Zambia. She recalls, “Take nothing but photos and memories, leave nothing but footprints.” “Into the Wild” invites the viewer to feel the awesome beauty to be found in a world that is wild and natural, but highly threatened. The animals are a part of this world: it is the human being who is the alien, and paradoxically, the steward of the land as well. The semi-finalists show the results of the worlds first art decathlon! After centuries of specialization in art that has relied on labels such as painter, sculptor or photographer, DCAC asked artists working in the DC metropolitan area to submit proposals exploring what “unspecialized” means to being a working artist today. 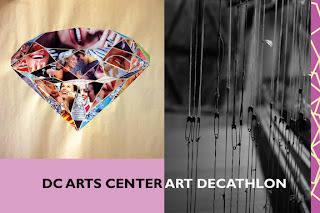 For the competition, decathletes produce work falling under 10 disciplines-- textiles/fiber; painting; drawing; printmaking; photography; collage; sound; video; conceptual art; and sculpture. Semi-finalists, Shanthi Chandrasekar, Lee Gainer, Lisa Rosenstein, and Mary Woodall. This exhibition culminates in a medal ceremony, but only one artist will walk away with gold! To follow the progress of the decathletes right now, visit the blog at dcacdecathlon.wordpress.com. 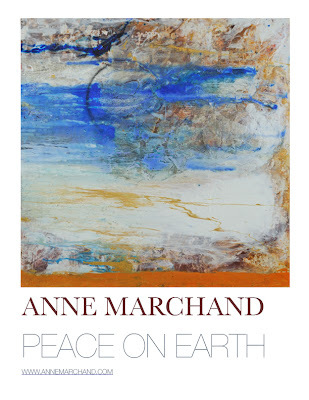 The exhibition will feature the encaustic paintings of Marcie Wolf-Hubbard, many of which focus on the grace of the figure. The “back and forth” of additive collage imagery is married with encaustic’s mysterious depth and transparency. Wolf-Hubbard is an instructor at Glen Echo Park teaching collage and mixed media for children and adults. More info. : (301) 634-2222 or glenechopark.org. Artist’s reception - Sunday, January 29, 4:00 - 6:00 p.m.
Gardner uses the vibrant colors and energy of his native Trinidad and Tobago in his paintings and mixed media works to address our often-complicated relationship with mass communication. Gardner’s works provide keen insight into how the proliferation of media in contemporary society results in a cacophony of mixed messages. Intricate layers of painted printed strips cover some canvases to interpret today’s advanced, digital modes of communication and their relationship to an intended thought or message. His uniquely vivid palette recalls the sky, sunsets, sea, and terrain of his Caribbean roots — yet his subject matter, style, and content speak more to our fast-paced urban environment. Jarvis DuBois is an independent curator and arts consultant based in Washington, DC. 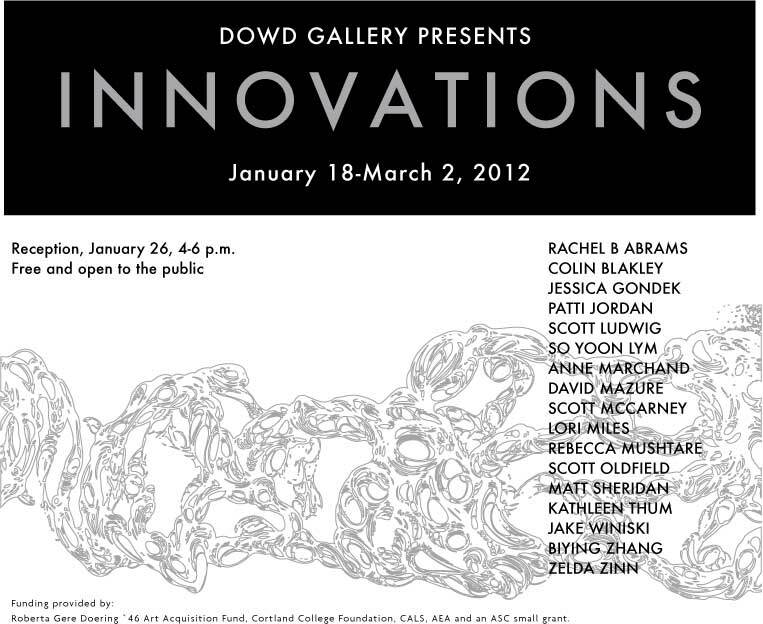 One of my paintings, Reverberation, was selected for the "Innovations" Exhibition at Dowd Gallery, SUNY Cortland. The exhibition opens on January 18 with a reception on January 26, 4-6pm. Check it out. New! 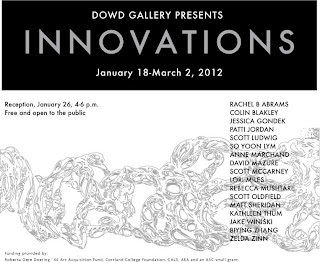 First juried show at established Washington DC gallery located in Georgetown. Theme: You, Me and Everybody Else. Artists are encouraged to consider broad contemporary interpretation of the figure. DEADLINE for received entries FEB 6 2012. $15 FOR 3 IMAGES. For details and entry form go to UP FRONT page on www.mocadc.org. Washington, D.C. - Today, the D.C. Commission on the Arts and Humanities (DCCAH) announced the appointment of veteran arts administrator Lisa Richards Toney as Deputy Director. "I am extremely excited to have Lisa join the DCCAH team," said Lionell Thomas, Executive Director of the D.C. Commission on the Arts and Humanities. "She has a long track record of success as an arts professional, including a previous stint with the DCCAH. We are pleased to welcome her back as we continue to grow as a world-class arts destination." Mrs. Richards Toney, a native Washingtonian, was previously an arts management consultant specializing in strategic planning and production and event management. Prior to consulting, Mrs. Toney served with the D.C. Commission on the Arts and Humanities for four years as Arts Program Manager and Interim Deputy Director. "I am honored to return to serving the Washington, D.C. arts community and the residents of our city. I look forward to working together with all of you and the committed team at the D.C. Commission on the Arts and Humanities to make an indelible impact on the arts and the community at large," said Richards Toney. She earned her Masters Degree in Educational Theater from New York University with coursework in Arts Administration and her Bachelors Degree as a Presidential Scholar from Spelman College in Drama and English. Mrs. Richards Toney was awarded a Vilar Institute for Arts Management Fellowship with the John F. Kennedy Center for the Performing Arts as well as a Thomas J. Watson Fellowship to study the management structure of Black British Dance Companies in the United Kingdom. by the National Endowment for the Arts. "In Unison: 20 Washington, DC Artists" represents a collaboration of a group of Washington, DC area artists, distinguished by their diversity in terms of accomplishments - emerging, mid-career, and masters; ethnicity - African American, White American, Asian American and Latin American; age - from the 30's to the 80's; gender - male and female; and varying artistic approaches - painters, sculptors, digital media and installation artists, and a few printmakers. These artists came together in the welcoming space of the print studio at George Mason University School of Art to each create 5 monoprints (from February to June 2010 and during the month of June 2011). While they were exploring their artistic expression individually through the printmaking process, the environment provided opportunities for interaction among the artists and promoted a true sense of collaboration. In the Washington, DC environment where art communities remain largely segregated, these artists crossed the color line both literally and figuratively, fostering hope for our world's future. Selected works from the over 100 monoprints created were initially shown at the Kreeger Museum and then selected works of the 20 at the Hillyer Art Space in 2011.
jduboisarts[at]aol.com. For group portfolio purchases, contact Neil and Juanita Hartbarger, in.unison.syndication[at]gmail.com. The Crystal City Business Improvement District (BID) is recycling the “Eco-Art” concept with today’s Call for Artists. The fully recycled theme brings back the popular and award-winning “Eco-Art” exhibition featuring environmentally inspired designs to the Crystal City Water Park. The previous rendition of Eco-Art by Sergio Martinez won the 2009 Design Arlington Award for Excellence. Martinez used sustainably- and locally- grown and harvested bamboo to mimic and reflect the dynamic characteristics of water through varying lengths, orientations, and heights. The pieces represented water in varying states of the liquid form including through the natural energy of waves, the geometry of a drop of water, or the rippling effect of water moving past an old wooden post of a pier. Today’s Call for Artists kicks off the search for qualified artists to conceive and implement a new interpretation of the Eco-Art theme. The exhibit is scheduled to open on April 2, 2012. Interested artists should visit www.crystalcity.org to learn more and download the formal application which is due by January 13, 2012.